People have been taking to the skies of North Carolina’s Outer Banks for more than a century. Here’s your insider guide. Everyone says you have to try hang gliding in Kitty Hawk when you’re on the Outer Banks. But being a “must see” doesn’t mean it can’t surprise you. Learn more about this classically North Carolina destination, and then go beyond the guidebook with our insider tips. For more than 100 years, people have flocked to Kill Devil Hills and Nags Head for a chance to take to the skies and experience the freedom of flight. Starting with the Wright brothers and their experiments with powered gliders in the early years of the 20th century, and continuing up through today, kite flyers and hang gliders come here to gather the wind in their wings. The Outer Banks has always been the perfect spot to take flight: The wind is just right, the dunes are just high enough and the sand is soft enough to ease your landing. If you want to try your hand at taking to the skies in a hang glider, you can. Certified instructors offer hang gliding courses for beginner, intermediate and advanced fliers, and it’s easy to join their ranks. Anyone can fly. Well, almost anyone. First, you have to be bold enough to strap yourself to a nylon wing and launch yourself into the sky. Then you have to weigh between 80 and 225 pounds, otherwise you’ll fly away with a strong gust or have a tough time leaving the ground. At Kitty Hawk Kites, the largest hang gliding school in the world, instructors teach the basics of hang gliding to more than 10,000 students a year. The Hang Gliding Training Center offers two ways to fly – dune hang gliding lessons for kids and adults on Jockey’s Ridge, and tandem hang gliding lessons at the nearby Currituck County Airport. No matter which school you choose, you’ll go through ground school where you’ll bone up on your hang glider safety. Then it’s time for flight school, when you, under the watchful eye of your instructor, grab a glider and take flight. Jockey’s Ridge State Park, right across the street from the Hang Gliding Training Center, offers the perfect location for dune hang gliding lessons. The high dunes and strong wind make conditions for your first flight ideal. Standing at the top of a dune ridge, you’ll clip into your glider and sprint down the face of the dune. The wind will lift your feet off the ground, and you’re flying. You won’t fly far or high – most flights are 30 to 100 yards long and 5 to 15 feet off the sand – but the thrill is unforgettable. Tandem hang gliding is the way to go for real thrill seekers. In tandem hang gliding, you and an instructor are towed by an ultralight aircraft to an altitude of either 2,000 feet or 1 mile, then released to soar over the Outer Banks. 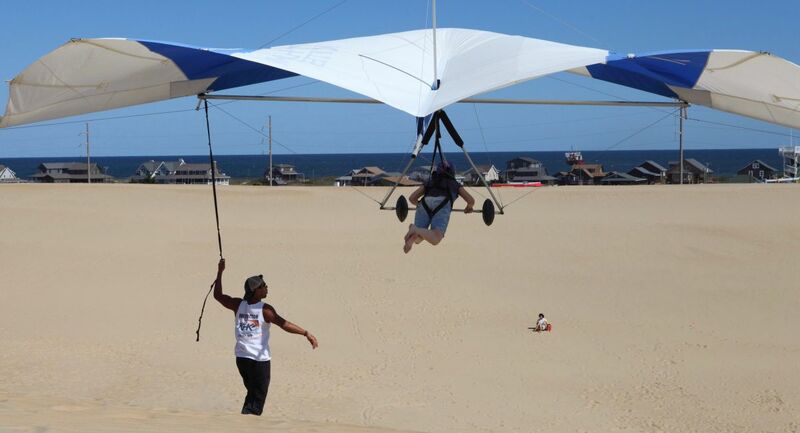 Experienced hang gliders – those with their United States Hang Gliding & Paragliding Hang 1 rating – can take higher-level courses, learn to become an instructor or fly on their own at Jockey’s Ridge. Once you’ve earned your Hang 2 rating, you’ll be ready to head out to North Carolina’s High Country and launch yourself from a mountain. If you visit in May, don’t miss the longest-running hang gliding competition in the world, the Hang Gliding Spectacular, at Jockey’s Ridge State Park. For more than 30 years, pilots from around the world have competed on the dunes and in aero-towing events.